Sub:- FESTIVALS — Ramzan Festival — Permission to all Govt. Employees of AP belonging to Muslim Religion including Teachers, Outsourcing and Contract employees to leave Offices / Schools early an hour in the evenings from 16-05-2018 to 15-06-2018 — Reg. Ref- 1) From State President, A.P. Minority Employees Welfare Association (MEWA), dated:20.04.2018. 2) Govt. Letter No.122/Poll.B/A1/2018, Dated:09.5.2018. 3) From the Chief Executive Officer, AP State Waqf Board, Vijayawada, Lr.F.No.E1/14/2016-AP, dt.03.05.2018 & 11.05.2018. 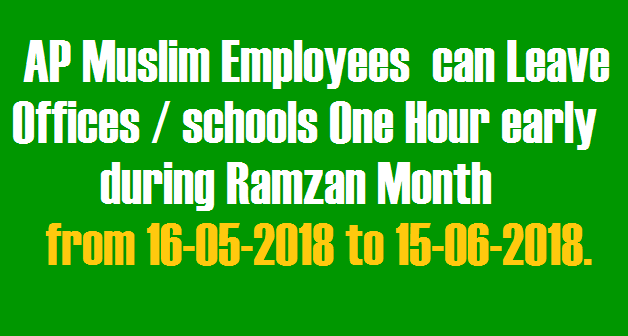 Government hereby permit all its employees who profess Islam including Teachers and Persons hired on Contract and out-sourcing basis to leave their Offices/Schools early by one hour in the evening on all working days during the Holy Month of "Ramzan" i.e., from 16.05.2018 to 15.06.2018 (both days inclusive) to perform necessary rituals, except when their presence is required due to exigencies of services during the said period. Download AP Memo No 122 Employees can leave their offices/schools at 4:00PM on all working days during the Holy month fo Ramzan from 16-05-2018 to 15-06-2018.